Conquering the four tallest Texas peaks in one day. Fighting exhaustion, we stumbled into camp at midnight after a day of epic hiking, gale-force winds, shredded shins, sore muscles, million-dollar views and four summits to our credit. We had done it. We had hiked the four highest peaks in Texas in a day. After 17 hours of hiking, all we wanted to do was go to bed. It sounded like fun when photographer Laurence Parent told me he wanted to climb Guadalupe Peak, the highest mountain in Texas. And the three next highest peaks. The idea seemed ambitious but not impossible, adventurous but not death-defying. A walk across the top of Texas was an adventure I couldn’t pass up. Kelsey Harkey takes a break at the Notch on Guadalupe Peak. 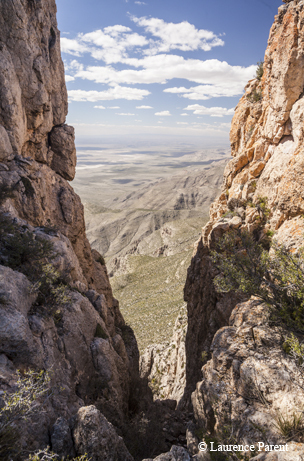 By fate of geography and topography, Texas’ four highest peaks all reside in the Guadalupe Mountains of West Texas, a range straddling the Texas-New Mexico line. Guadalupe Peak, Bush Mountain and Shumard and Bartlett peaks line up in a neat curve around Pine Spring Canyon in Guadalupe Mountains National Park. The Guadalupes contain seven of the eight highest peaks in Texas. Mount Livermore in the Davis Mountains sneaks in at No. 5, and Big Bend’s landmark Emory Peak comes in as the ninth highest. the Davis Mountains to bag peaks with the clock ticking away. There’s hardly a more spectacular hike in Texas. The peaks of the Guadalupes rise a vertical mile above the salt flats to the west, providing a sudden and dramatic change in topography. Soaring cliffs rise 1,500 feet on the southern and western flanks of the mountains. Ridgelines connect the peaks, with sheer dropoffs on one side and terrain sloping down to Pine Spring Canyon on the other. Ponderosa pine, Douglas fir and southwestern white pine trees partly forest the mountainsides, unlike almost anywhere else in Texas. Yuccas, grasses, agaves and other desert vegetation blanket the mountain slopes. We picked a day in April and recruited some friends and colleagues to join us for the adventure: artist Mary Baxter of Marfa, Ky Harkey of the Texas Parks and Wildlife Department and Ky’s sister Kelsey Harkey, who was getting ready to spend the summer working at a Wyoming resort. The hikers make their way up Guadalupe Peak, the first of four summits planned for the day. 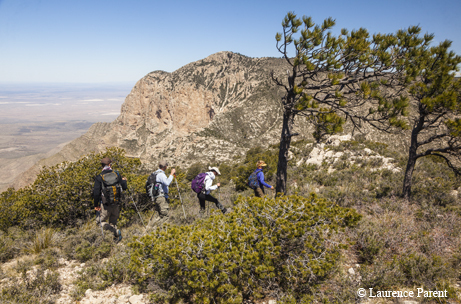 We planned to start by ascending Guadalupe Peak, a feat thousands of hikers accomplish each year. The climb gains almost 3,000 feet of elevation, going from 5,800 feet above sea level at the campground to 8,749 feet at the summit. It’s steep, but a trail switchbacks its way up the mountain. Then we’d head north to Shumard Peak, the third-highest peak in the state at 8,615 feet. The good news: It’s only about a mile as the crow flies. The bad news: It’s cross-country, and we’d be losing about 1,000 feet of elevation and regaining about 900. We would repeat the process for the next peak, Bartlett, the state’s fourth highest at 8,508 feet. Then we’d descend again and ascend to the state’s second-highest peak, Bush Mountain, at 8,631 feet. The drops and distances between peaks looked to be less intense with each successive traverse. At Bush, we would reach a trail and hike it seven miles back to the trailhead. It would be a challenging day filled with hiking, climbing, route-finding and bushwhacking. And, it turns out, a good deal of curiously enjoyable stick tossing. 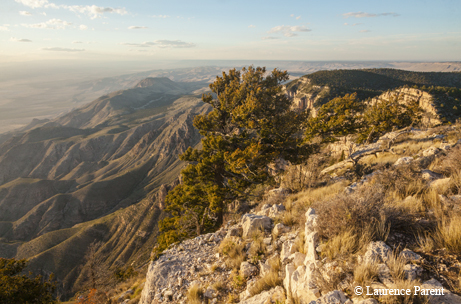 The hike up Guadalupe Peak is spectacular on its own and a highlight of any Guadalupe Mountains trip. We started at sunrise, the crunch of our boots on the rocky trail punctuating the quiet of the morning. The first mile and a half of the hike is probably the steepest, and we soon found ourselves breathing hard, stopping occasionally to rest and catch our breath. We passed some hikers who were already struggling up the trail, and were passed by others who seemed to be racing to the top. The views just got better the higher we climbed. At a spot called the Notch, the vegetation abruptly shifted. Pine and fir trees replaced the cactus that had been around us. Rounding the corner of the Notch’s limestone outcrop, we got slapped in the face with a blast of wind, a little taste of what was to come. In the week leading up to the trip, the forecast had changed daily — initially calling for high wind, then no wind, then wind again. I told the others it wouldn’t be a true Guadalupe Mountains trip without a little wind. 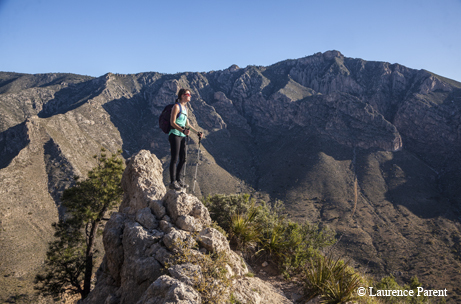 Mary Baxter takes in a view of the backside of El Capitan from a spot near the top of Guadalupe Peak, the state's highest peak. Another set of switchbacks brought us to the final push to the summit. As we swept around the south side of the peak, we saw the backside of El Capitan, the signature formation of the Guadalupe Mountains. 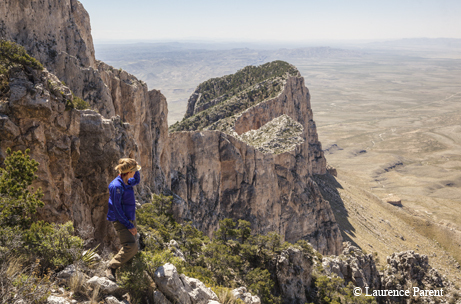 When you approach the park from the south, El Capitan’s towering prow of limestone surges up from the desert floor, standing loud and proud to announce that you have arrived at the Guadalupe Mountains. Guadalupe Peak, connected to El Capitan by a ridge, is the higher peak, but El Capitan is the one that demands notice, like a little brother jumping in front to insist that attention must be paid. Ky and I plotted paths along the ridge to the summit, scheming for a future adventure. We reached the summit in a final burst and stood at the highest point in Texas. A dozen or so hikers were already there, soaking up the views, taking photos and signing their names to the summit register, a notebook stored in an ammo box. The register summed up the accomplishments and feelings of those who had made it to the top: “I did it!” “Gorgeous view.” “Two thumbs way up!” “Hi, Mom.” We could see salt flats, sand dunes, foothills and distant mountains extending into the vast stretches before us. At the summit, Ky pulled a surprise for us out of his pack — what he called Secret Snack No. 1 — a box of caramel chocolate truffles. It was already 11 a.m., later than we’d hoped. After enjoying some time on the summit, we figured it was time to move on. After all, this was only the beginning. 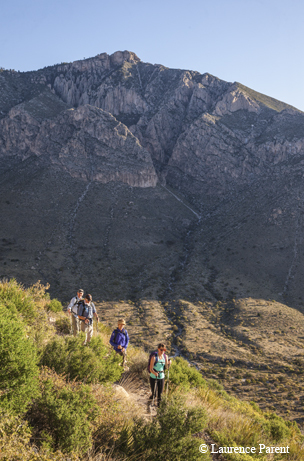 We knew that the Guadalupe-to-Shumard traverse would be the longest and toughest of the day. The mountaineering website Summitpost.org calls Shumard “the hardest-won of the primary, named summits in the main section of the park.” It goes on to warn: “Any way chosen to the top of this mountain involves thrashing through prickly desert brush on rocky, trail-less terrain.” Sounded like a plan. Most hikers at the top of Guadalupe Peak turn around and head back down the way they came on the main trail. We stepped off the opposite, trail-less side, not knowing quite what lay ahead. “This is where the adventure begins,” Laurence said, capturing the spirit of the moment. It was a steep initial descent, down a loose, rocky slope with some bushwhacking required through trees and brush. Before long, we found ourselves in the middle of a pine and fir forest. The smell of pine needles made us feel as if we had been dropped into the middle of Colorado. Once out of the forest, we again waded through thick brush, which grabbed at our pants and tore at our legs with every step as we hiked. Shumard Peak, the state's third-highest mountain, is the hikers' next destination as they descend from Guadalupe Peak. At the top of Guadalupe Peak, Ky and Kelsey had put on leg-protecting gaiters as a shield against the underbrush. Laurence had pointed out that the worst of the desert scrub — bad boys such as catclaw and prickly pear — wouldn’t be found at the higher elevations, and he dismissed the gaiter-wearing Harkeys as “pessimists.” Now, with our legs already scratched up, they looked more like visionaries. If the brush wasn’t enough, we encountered one of our most formidable challenges when we reached the bottom of the valley between the two mountains — the wind. Wind coming across the desert gets compressed when it reaches the mountains — there’s less room for the wind to pass through, and that increases the wind speed, a phenomenon known as the Venturi Effect. At certain points like the one we just reached, the wind gets further compressed as it is funneled between two peaks, thus increasing its speed even more. Bam! Double Venturi Effect, right in the face. If I had to guess, I’d say the wind reached 50-60 mph or more. It almost knocked us to the ground. Kelsey had mentioned that she had almost been blown off Guadalupe Peak as a Girl Scout, and it looked as though she was about to get a second chance to get knocked off the peak. We looked for ways to escape the wind but found none. The wind hit us hard, pushing us around and constantly threatening to blow our hats off. Wind takes a physical toll, but it takes a psychological toll as well. Everything seems more difficult. Emotions are raw. You try to curse the wind but get only halfway through before another gust stops you short. The uphill section on Shumard loomed directly ahead of us. Mary proposed taking a break behind a rock up ahead to get out of the wind, regroup and have something to eat and drink. As we approached the rock, we realized it wasn’t big enough to offer any respite from the wind. Disappointed, we took a break anyway. Things suddenly started to feel a little desperate. This was turning into an emotional low point for Team Four Peaks. The wind howled nonstop. The cross-country travel was going slower than expected. We were having to thrash through the underbrush. We had a big climb ahead of us. We worried about the time: It was already 1:30 p.m., and we had only one peak under our belts. Our prospects for finishing the hike seemed to be going downhill fast. And did I mention the wind? We started to consider an exit strategy. Descending to the bottom of Pine Spring Canyon was the obvious way out, but it looked as if it required an unpleasant thrash-fest to get through it. We decided our exit plan was to keep going. From the top of Shumard, we could measure our progress from Guadalupe Peak and chart our course to Bartlett and Bush. The upcoming Shumard-to-Bartlett traverse looked easier than what we had just done, and Bartlett-to-Bush looked easier still. Across Pine Spring Canyon, we could see the trail we would be taking later in the day back to camp. Our whole day was spread out right in front of us. Ky lifted our spirits with Secret Snack No. 2 — mint honey tea. Then it was on to Bartlett. Along the way we found some relief from the wind. It even seemed calm in some places, a welcome change. As we followed the ridge, we realized that over the desert-side edge of the ridge, the wind was blasting up the cliff walls, blowing like a never-ending hurricane. But just a few steps away from the edge, the wind was much calmer, more of a steady, forceful breeze. Ky decided to see what would happen if he threw a stick off the edge into the howling wind. He tossed a small stick, and the wind caught it, thrusting it way up over our heads and carrying it a couple hundred feet away from the edge of the cliff. He tried a bigger stick. Same thing. He tried a big stick with multiple branches, and the wind carried it like a feather. All of a sudden we had a game on our hands. We took turns throwing stick after stick, watching the wind carry them up and over our heads and getting giddy with laughter. With this bit of entertainment, it now seemed as if we might be able to handle the wind after all. Whenever we got the chance on the rest of our hike, we’d look for a stick to toss just to see how far the wind would take it. Ky even took his chances and tossed his trekking pole, and sure enough, the wind swept it up. Ky then added to his mileage by having to retrieve it. A notch on the way up Bartlett Peak, the state's fourth highest and the hikers' third peak of the day, offers a view to the west. As we hiked, Kelsey pointed out fossils in the rocks along the way, a reminder that we were hiking on one of the oldest fossil reefs in the world, a mass of seashells and calcified algae formed more than 250 million years ago, when the continents were still pushed together in the mass known as Pangea. Once we got to the valley between the peaks, with the uphill ahead of us, suddenly Bartlett didn’t look any easier. “They usually say don’t look down, but maybe we shouldn’t look up either,” Mary said. The breaks from the wind were short-lived. It seemed as if our trek was 65 percent hiking and 35 percent holding on to our hats. Even if I got tired of holding onto my hat and wanted to throw it off the side of the cliff in a fit of frustration, I couldn’t. The wind would have caught it and thrown it back. Things got especially tense when our route led us right along the top of the cliff for several yards with a thousand-foot drop staring us in the face and the wind blasting us nonstop. Don’t look down, they usually say. On Bartlett, we picked our way up a perilous path — a steep, rocky, brushy slope with loose rocks rumbling beneath our feet — and reached the summit at 5:45 p.m.
“We really are on top of the world up here,” Mary said, looking out over the seemingly endless foothills, desert and distant mountains. The end was in sight. Bush Mountain, our fourth peak, looked close, and most of the cross-country hiking was behind us. Ky popped out Secret Snack No. 3 for our third peak: chocolate chip cookies. “We might just survive this experience,” Laurence said around a mouthful of cookie. To get to Bush, we picked what we figured would be the path of least resistance across the valley. Again, it proved tougher than it looked. Our legs ached with fatigue, and our shoulders cried out from carrying packs all day. Mary deemed the ascent “steeper, rockier, windier and brushier” than the others. Drawing on our reserves, we finally made it to the top. Peak No. 4! We whooped it up and high-fived as we arrived just before sunset. Bush Mountain isn’t a classic mountain spire; instead, it has a flat, grassy top with trees dotting the broad summit. It’s hard to even determine where the true summit is. I searched … where was it? I wasn’t going to go to all that trouble and not stand on the real summit of the final peak. We finally found a plaque marking the spot. Looking south, we could see the three previous peaks we had scaled — Guadalupe, Shumard and Bartlett — lined up behind us. The sunset was stunning from our spot on the western escarpment. Seeing the cliffs, foothills and distant mountains bathed in golden light, we must have felt the same emotions as John Russell Bartlett, a U.S. boundary commissioner who eloquently chronicled his travels through the Guadalupes and for whom the fourth-highest peak is named. “No painter’s art could reproduce, or colors imitate, these gorgeous prismatic tints,” he wrote. From the top of Bush Mountain, the state's second-highest peak, the sunset casts a golden light across the desert. Conquering climbs, descents, wind, brush and darkness gave us the feeling of accomplishment that testing your limits in the outdoors can provide. It was challenging, full of emotional — and literal — ups and downs. And it was even fun, in an “only for masochists” kind of way.